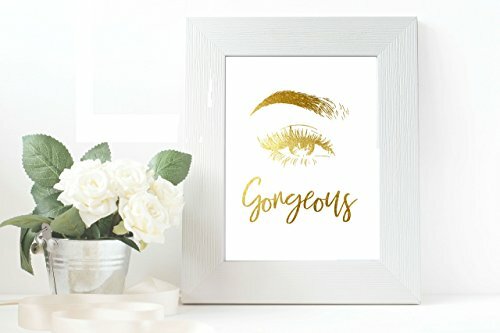 Start Decorating Your Home Like a Professional - Allow your superior choice in wall art to highlight your unique personality. The gold foil print will have an embossed effect. Each gold foil print is made by hand. This handmade piece will add Light and Luster to your living space. Our highly detailed golden artwork can spark conversation and brighten any household area. This piece will look great with your favorite frame. Give your home or living area a personal touch with the "My Golden Wish" collection. Add it to your cart today! -HANDCRAFTED by our Professional staff weekly -PRINTS arrive wrapped in a protective plastic coating with our seal indicating an authentic product -ORIGINALLY CRAFTED from a luxury grade Golden Foil sourced inside the united states -GOLDEN FOIL DESIGNS shine brightest against their pure white matte card stock backing -PERFECTLY BRILLIANT and shiny, this print is the ideal accent piece - it will grab attention with its sparkle and shine, but it won't overwhelm and it will work with just about anything! If you have any questions about this product by My Golden Wish, contact us by completing and submitting the form below. If you are looking for a specif part number, please include it with your message.